This entry was posted in Uncategorized on April 30, 2017 by Gary. There will be two events next week capable of acting as the event trigger to reverse the current trends. One is the FOMC meeting (least likely in my opinion as there will be no surprises) and the other will be the French elections (most likely in my opinion). 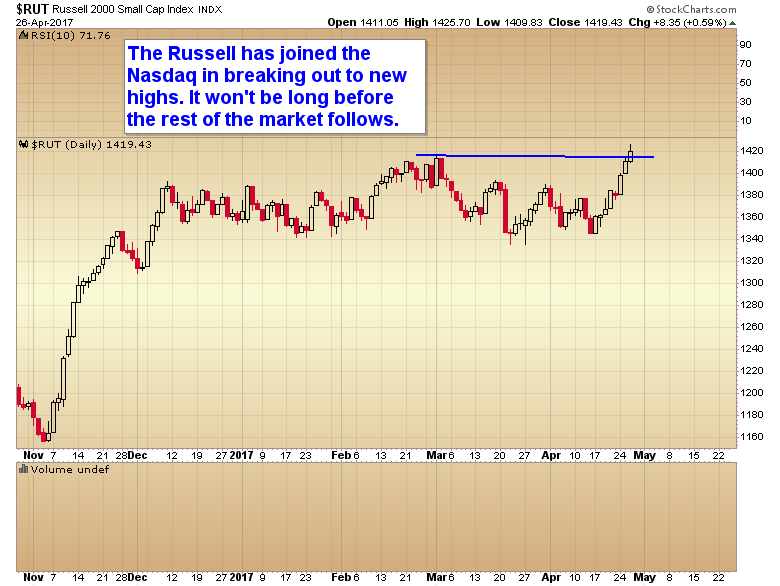 I’m going to go over the ramifications for gold and stocks in the weekend report. One or the other should produce the DCL in gold, and possibly a top and maybe deeper correction in the stock market. This entry was posted in Uncategorized on April 28, 2017 by Gary. GLD really hasn’t started to breakdown yet. The 10 day moving average is just starting to roll over. The gap around 116 (GLD) is likely to fill before this cycle bottoms. This entry was posted in Uncategorized on April 27, 2017 by Gary. This entry was posted in Uncategorized on April 26, 2017 by Gary. MARKET WRAP – BUBBLE PHASE IN STOCKS? The S&P 500 has formed a triangle continuation pattern with a breakout above the upper trend line. The DJIA is acting like a new intermediate cycle has begun. 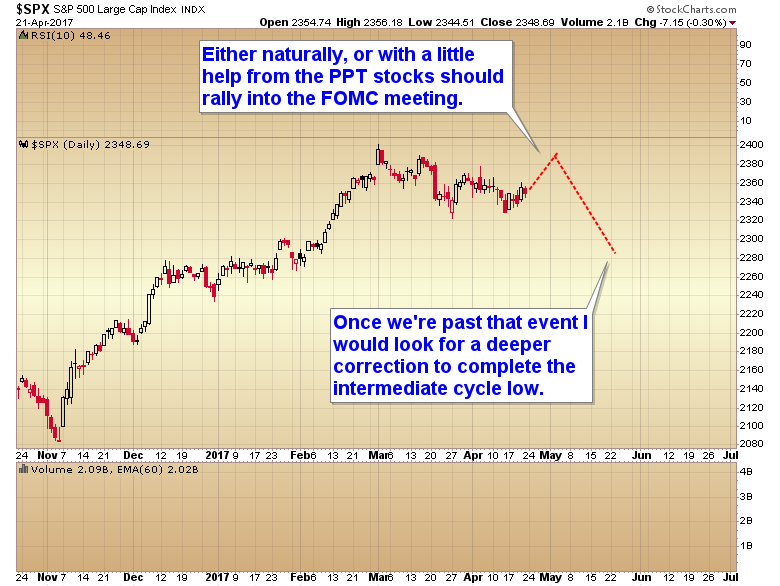 The rallies our of intermediate cycle lows tend to be very powerful. This entry was posted in Uncategorized on April 25, 2017 by Gary. Gold – DCL NEXT WEEK? 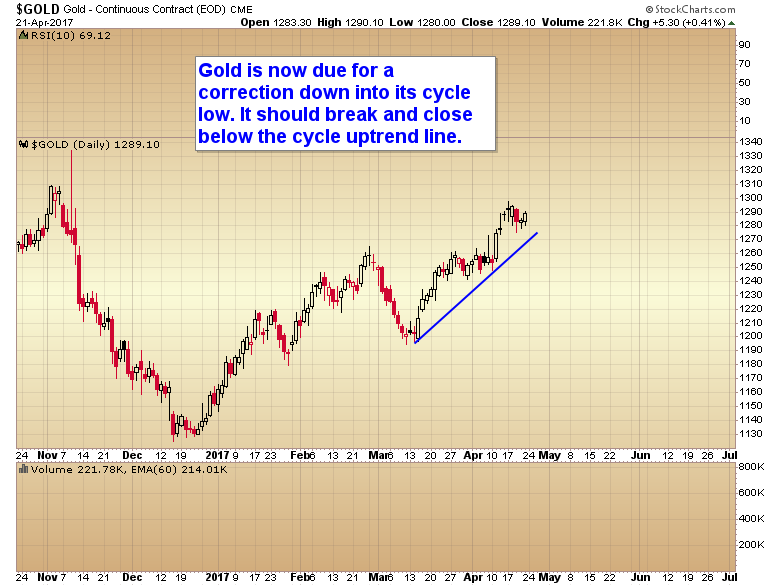 Gold has given us a couple of confirmations that it is dropping into its daily cycle low. First, gold has closed below its 10 day moving average. And second, gold has traded below its daily cycle trend line. However, it is too soon to buy this setup as this video will explain. This entry was posted in Uncategorized on April 24, 2017 by Gary. Over the last several years one of the most consistent trades has been to get long stocks ahead of an FOMC meeting. Let’s face it, it just makes the Fed’s decision making process a hell of a lot easier if stocks are rising, and at, or near all time highs. With Trump unveiling his tax cut package next week I expect the market will be ready for a bounce either naturally, or maybe with a little help from the PPT. So I expect we’re going to be testing the all time highs by May 3rd. After that we probably have a deeper correction in store by the end of May. So far this correction has lasted long enough, but it hasn’t dropped far enough in my opinion to qualify as a completed intermediate cycle low just yet. As gold and stocks have been inversely correlated lately, I expect gold to drop down into its daily cycle low during this period. There is likely to be some volatility on Monday following the French elections but once the market settles down stocks should trend up into the FOMC, and gold should trend down into its daily cycle low. I’m going to cover in detail what I expect from both metals and stocks once these counter trend moves are complete in the weekend report. This entry was posted in Uncategorized on April 22, 2017 by Gary. When a resistance zone gets tested multiple times it usually breaks. 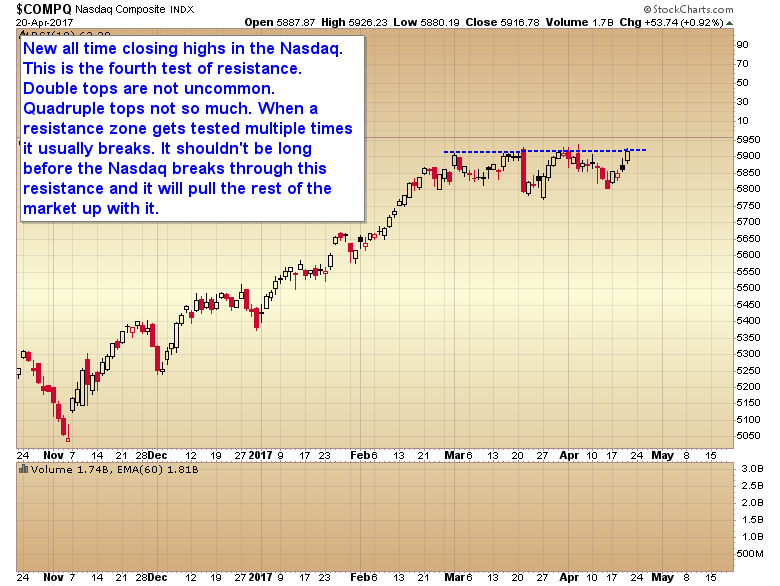 It shouldn’t be long before the Nasdaq breaks through this resistance. After it does it will pull the rest of the market up with it. This entry was posted in Uncategorized on April 21, 2017 by Gary.